Prabodkumar Sanyal (born: July 7, 1905 - death: April 17, 1983) was a renowned Bengali pen man, journalist and traveler. He was a popular personality of the writer group in delight (Kallol) era. His first novel 'Zazabar' (1928), and 'Mahaprasthaner Pathe' the travel tales have occupied a special place in Bengali literature. He traveled to many regions of Asia, Europe, America and Russia and his huge travel experience helped him to write travelogue. 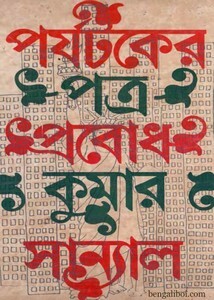 Now I want to share an ebook of his written- Parjataker Patra. The ebook has 283 quality pages, 20mb pdf size.